We are very proud to have been awarded two green flags. In 2012 we received our first flag for Litter and Waste. We received the second in 2017 for Energy. is féidir libh ár plean Gníomh a fháil anseo. You can view our current updated Action Plan here. Bhí seachtain Fuinneamh againn sa scoil. D'fhoghlaim muid go leor faoi an téama leictreachas agus teas le linn an tseachtain. We had a full week learning about the energy we use at home and in our school. Take a look at our projects above. You can also download our home survey below. Bhí lá gan leictreachas ar siúl againn i nGaelscoil Uí Earcáin chun leictreachas a shábháil agus a chuir chun cinn sa scoil .Ní raibh céad ag na múinteoirí, páistí ná tuismitheoirí leictreachas a úsáid sa scoil .Bhí cosc ar úsáid na soilse, na ríomhairí, an clár bán idirghníomhach agus aon rud eile a bhí le luchtadh nó le bheith ceangailte leis an chóras cumhachta. 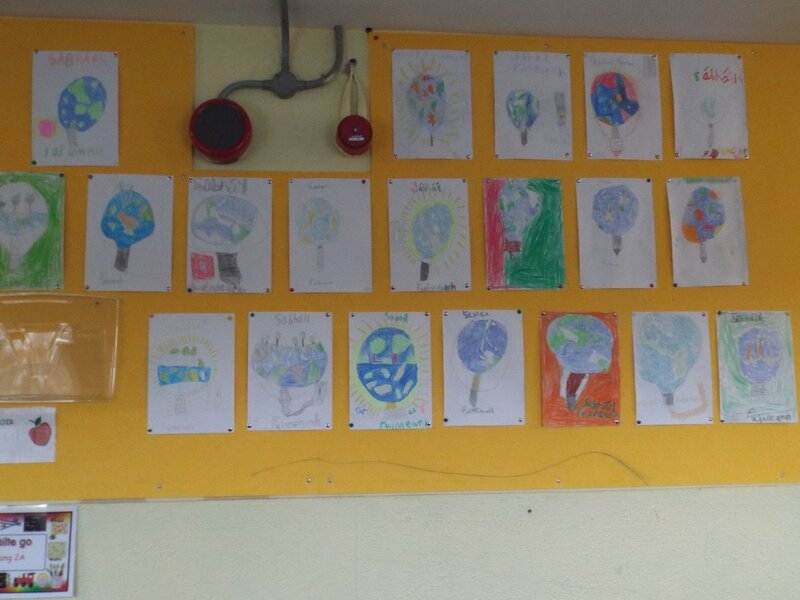 We had a electricity free day in Gaelscoil Uí Earcáin to promote saving electricity in our school. The teachers ,students and parents in the school that day, weren’t allowed to use electricity. There was a ban on the use of lights , laptops, interactive white boards and anything else that had to be connected to a plug. Bíonn na páistí sna hardranganna i gceannas ar na doirse a dhúnadh . Dúnann said na doirse gorma na scoile chun an teas a choimeád istigh. Tá clár am leagtha amach againn. The children in the upper classes are in charge of closing the yard doors at lunch .They also close the blue doors at lunch to keep the heat in school . There is a timetable for this to secure the heat in the building for longer. Bíonn monatóireachta á déanamh ag na páistí atá ar choiste Ghlas na scoile ar leictreachas agus teas na scoile. Bíonn said ag díriú isteach ar na soilse agus an teas a choimeád istigh san a ranganna i rith am loin. Bíonn na monatóirí ag dul timpeall go dtí na ranganna ag baint dhó na soilse ionas nach bhfuil leictreachas ag dul amú. Dúnann siad na doirse chomh maith ar na seomraí ranga, le déanamh cinnte nach bhfuil teas ag éalú i rith am loin. The children on the Green school committee monitors the use of electricity and heat in the school. Their focus is the light and heat in the classrooms during lunch . The monitors go around to the classrooms turning off the lights to make sure electricity is not being wasted. They close the doors of the classrooms to unsure that heat doesn’t escape. Rinne rang a cúig tionscnamh maidir leis an athchúrsáil sa scoil .Bhí siad a déileáil le téarmaí maidir le athchúrsáil agus ealaín ,próiseas athchúrsáil ,athchúrsáil sa gnáthphobal .Thaitin an tionscnamh go mór leo agus d’fhoghlaim siad go leor. 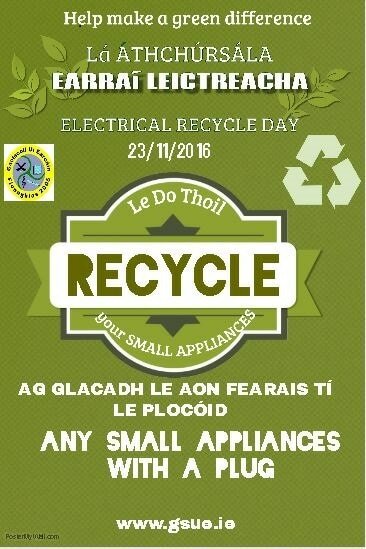 Bhí an tionscnamh le feiceáil i ait fáilte na scoile. 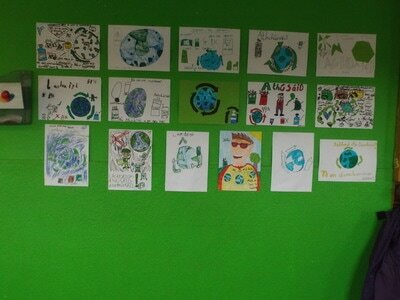 The children in fifth class made projects on recycling, they explored the theme with the reference to different topics . 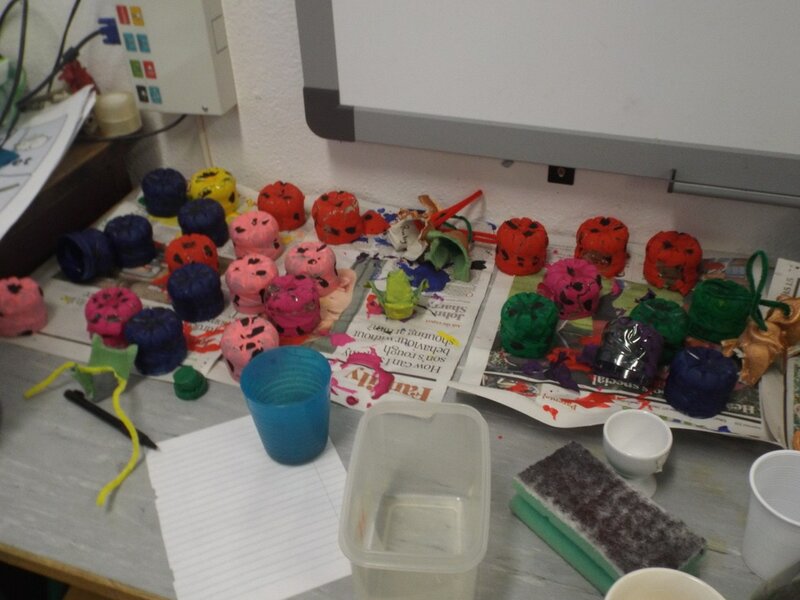 The children enjoyed the project and learnt a great deal from it . Bailíonn múinteoirí agus tuismitheoirí i ranganna na naíonáin earraí cosúil le sean bhoscaí páipéar, earraí páipéar, nuachtáin ,iris srl le haghaidh seomra aistear na scoile; .Is féidir leis na páistí píosa ealaíne a chruthú bunaithe ar théama na míosa. Thaitin sé go mór leis na páistí áit go bhfuil siad ag foghlaim Gaeilge agus ag foghlaim faoi na deiseanna le cúrsaí athchúrsála. In the seomra aistear the children used recycled material during the recycling section of the lesson which is junk art. 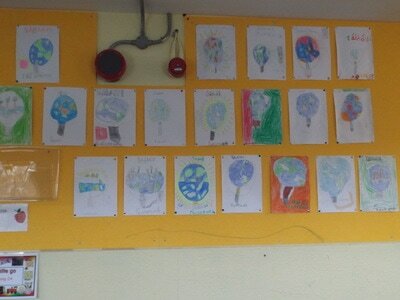 The children use paper ,cardboard ,magazine cutting and other materials to create there works of junk art.